Last night, I took a major step in my long-term goal to free myself from the curse that is Microsoft Windows. I’ll never be able to get completely away from it, but I can choose to use something other than Windows for my daily work. I’ve spent the last 3 months using my Mac mini almost exclusively … but what to do about my Sony laptop? I’ve messed around with Linux a lot over the last few years and have seen the OS become much more appropriate for the desktop environment, so I decided to take the plunge! First, I installed SUSE Linux 10.0 (don’t ask why, I’m still not sure myself). The install process was ok, but I never could get my screen to work correctly. Also, I soon realized that I just don’t like KDE. So, I scrapped SUSE and installed Ubuntu 5.10 (Breezy). It took only 54 minutes to install, and about another 10 minutes to configure my monitor. Even the Sony hot keys work (they haven’t worked under Windows for some time now). Life is good. I installed a load of great software via Ubuntu’s cool “Add Applications” feature. I read a few tutorials to get Opera and Firefox 1.5 working correctly, and then installed VMWare Player. This is where it gets cool. Lets face it, there are times when we still need windows (testing your website in IE, for example). 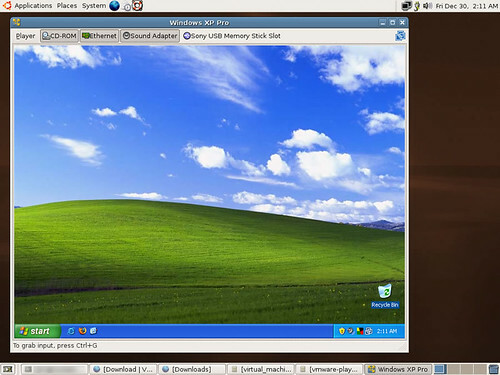 I already own Windows XP for the machine, so why not use it? I didn’t want to do a dual-boot system, so I’m using VMWare’s free player. It was pretty easy to set up, and you can see the results below. So far, I’m pretty happy. And what was the total cost for this setup (beyond what I already spent for Windows)? FREE! Now, doesn’t that feel good?